The economy of the Awash basin is highly exposed to hydrological variability. Despite an apparently abundant supply of water in aggregate terms, the basin routinely suffers from localised water shortages at specific points in space and time, and is prone to destructive episodes of flood and drought. 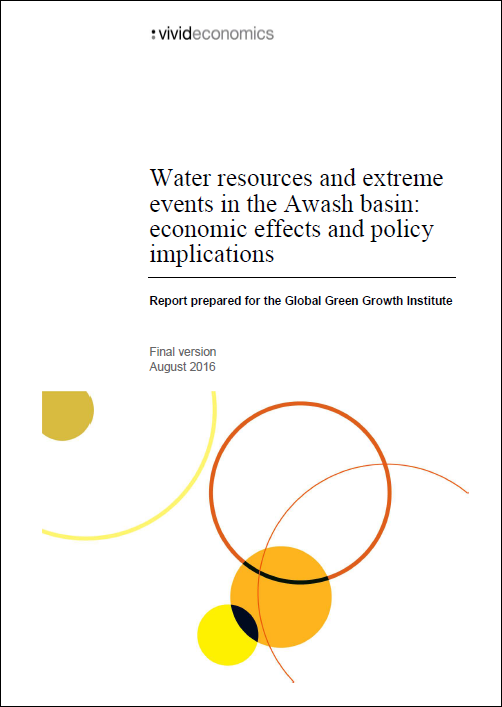 This report, produced by Vivid Economics on behalf of the Global Green Growth Institute, seeks to better understand and quantify this critical economic vulnerability, and draw out the implications for water management policies. The study analyses the sensitivity of the basin’s crop production to water scarcity and extreme hydrological events, before considering how these impacts transmit to other sectors. Crop output in the basin not only depends on the overall level of rainfall and incidence of flooding and drought, but is also sensitive to the timing of rains and their distribution across areas of the basin. As a consequence, large production losses are possible under a diverse range of plausible future climate scenarios: both where the level of rainfall decreases and where its distribution over space and time changes. The knock-on effects on other sectors in the economy tend to amplify these losses, as reductions in the supply of agricultural produce leading to a fall in productivity in other sectors.